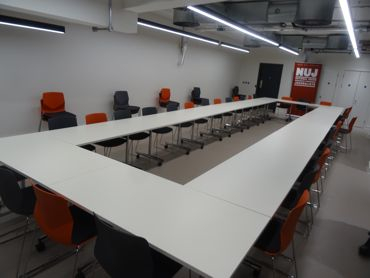 Freelance Oct18: Vacancies on NUJ Industrial Councils - how to seek London Freelance Branch's nomination for these elections, deadlines, eligibility. THERE ARE vacancies on the NUJ's national-level Councils, bodies made up of members that meet regularly to formulate policy and oversee activity in sections of the membership. There are Industrial Councils for work-related areas - among them the Freelance Industrial Council (FIC), which has a vacant seat representing Black Members, another for a member with a London address and one for North West England as well. The Photographers' Council has a vacancy for a member from South East England - with a postcode outside London. Other Industrial Council seats cover regional or specialised areas; there is a list of the current vacancies on the various Industrial Councils on. the NUJ website. (Any queries on this should be directed to Leyla Yusuf at the NUJ head office via leylay@nuj.org.uk.) Freelance members receive travel expenses and small allowances for attending Councils. Note that the National Executive Council (NEC), the Scottish Executive Council and the Welsh Executive Council seats would be suitable for members with considerable experience in NUJ activism. For more on eligibility to seek nomination for Industrial Council seats representing a specific demographic, region or industrial sector see our guide from earlier this year. Candidates first need to seek the nomination of an NUJ Branch (not necessarily their own Branch). If you are seeking LFB's nomination to stand, you will need to email to Branch Secretaries (Phil Sutcliffe philsutcliffe47@gmail.com or Tim Gopsill timgo@btinternet.com) in plenty of time for the Branch meeting on 12 November, (10pm the previous evening is not plenty of time.) The Branch is also expected be inviting nominations in the October meeting on 8 October. Or put yourself forward in person at either of those meetings - but you don't have to show up to the meeting to seek LFB's nomination. Once nominations have closed on 20 November, if any seats are contested there will be postal and online ballots among the NUJ membership.